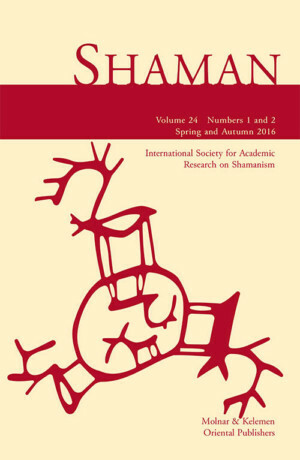 Articles in this volume are dedicated to Vilmos Voigt, an outstanding scholar of religious studies, and a member of the Editorial Board of Shaman, Journal of the International Society for Academic Research on Shamanism on the occasion of his seventy-fifth birthday – Part Two. Stories told among the Nganasan people of the Taĭmyr Peninsula in Northern Siberia that recount the outstanding deeds of their shamans retain their central importance to this day. A significant proportion of these myths recount the unrepeatable deeds of the mythical shamans, the ur-fathers of the clans (Khoterie, Fala). The outstanding deeds of the shamans that followed him move beyond the general abilities of the shamans; they shock their audience and thus become suited for generations to recount them and to use a particular shaman story as a reference to a particular clan as well. These deeds could be positive (for example, freezing a flowing river to make it crossable, resurrecting a person who has been dead for a year and curing a deity) or negative (for example, making a drum for himself out of the skin of an orphan girl). Each of the shaman’s deeds has an influence on the community with which he is entrusted. The figure of the shaman is therefore suitable to representing the entire clan. A tentative translation and interpretation of an Ekhirit Buryat shamanist invocation in alliterative verses recorded by L. Gomboin in 1932 and published in N. Poppe’s collection of Buryat Mongol dialectal and folklore texts in 1936, with no indication of the circumstances of the recording, the gender of the performer and the aim of the sacrifice offered. Among the Surgut Khanty, whose shamanism this article deals with, old folk traditions, and archaic ideas and beliefs, have been preserved, alongside people who, even today, possess special gifts; this is a reflection of the area’s isolation, among other ethnocultural reasons. We cannot speak of shamanism here as an exclusively integrated phenomenon, as it is impossible to define an exclusive and cohesive method for acquiring shaman knowledge. The Khanty have long been familiar with men with special capabilities; each type had its own name. Now, unfortunately, it is not always possible to distinguish the ranges of duties or to define the differences between the methods and knowledge of those performing the cult: many things have now fallen into oblivion. In this area a person may become a shaman in various ways. He may receive the ability from his ancestors (by inheriting it), he may learn the craft from an experienced shaman, or he may be chosen by the gods. However, my own data confirm that the main way of becoming a shaman is by being chosen. One of the signs of being chosen was good fortune in hunting or fishing. On the basis of my collection work, the diverse tasks of Surgut Khanty shamans can be divided into three main groups: (1) clarifying questions related to the course of people’s lives, such as shamanizing in cases of sickness, birth, and death; (2) shamanizing for the effectiveness of work activities; and (3) conducting the communal ceremonies. According to my informants, the power of the shaman depends on the strength of the god who has chosen him/her and on his/her helping spirits, although in general male shamans are stronger than female shamans. Today the number of shamans has decreased, and their knowledge is less than that of their ancestors, but the belief that in hard times, of bad health or financial troubles, they can be a help, is still alive. This paper explores the integration of religion, shamanism and voodoo through the life and acts of one gorovodu (voodoo of the kola nut) practitioner named Sofo Bisi among the Ewes of southern Togo. Bisi is a regional shaman and diviner (bokonosofo) with almost sixty years of experience working with voodoo spirits, plant-based medicines, and extensive ritual to protect individuals and the social order of the community. The purpose here is to espouse negative associations and misunderstandings surrounding “voodoo” and related orders, and to stake a claim for such rituals as true shamanism. This paper stems from ethnographic research into gorovodu by the author from 1996–2015; topics such as healing, spirit possession, witchcraft, topics such as spirit possession, healing, and witchcraft are evaluated and synthesized within the frameworks of voodoo and shamanism. The present paper presents my hypothesis that three pioneers laid the foundation of fieldwork-based research on northern Eurasia in the 1840s in such a way that we may speak about a new research paradigm, Northern ethnography. The concept of paradigm is used in the sense proposed by Thomas S. Kuhn (1970, 1977) as a “disciplinary matrix” of “exemplars” followed in the choice of research approaches and methods. The three founders of the method are introduced in this paper: Matthias Alexander Castrén, Antal Reguly, and Lars Levi Laestadius. How their work is related to the other fieldworkoriented research, now called anthropology, will also be discussed. A link between Northern ethnography and cultural anthropology is found in the career of Kai Donner, the Finnish disciple of the first generation of the pioneering scholars of British anthropology. Donner’s fieldwork, which took place among the Samoyeds in 1911–14, just at the beginning of the First World War, continued Castrén’s and Reguly’s Siberian studies. In Gansu Province of Northwest China, there lives a small minority, called Yugur. They consist of two distinct groups: the Kara Yugur who are the descendants of the Orkhon Uighur Empire and speak a Turkic language, and the Shira Yugur who are one of the so-called White Mongol tribes from the Amdo Region of Tibet. The Mongolic-speaking Shira Yugur follow Tibetan Buddhism while the Turkic-speaking Kara Yugur have preserved their shamanic traditions practiced by a specialist (elči) until recent times. The earliest information collected on Kara Yugur shamanic traditions date back to the beginning of the 1900s. In 2011 and 2013, I visited the Western Yugur and collected data on Korgui, the last elči to conduct the yaka ritual. I also recorded a short myth from his daughter on the emergence of the first shaman. 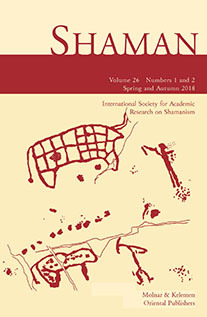 The present article seeks to shed some light on the Kara Yugur shamans and their vanishing shamanic practices, as well as their relation to Tibetan Buddhism and the Shira Yugur religious traditions. Like many tribal communities worldwide, customary territories are the source of indigenous knowledge, religion, rituals, and social and political adaptation for Peninsular Malaysia’s indigenous minority, the Orang Asli. Despite recent challenges to the vibrancy of shamanic practices due to external and internal changes impacting Orang Asli society, the Orang Asli shaman, to some degree, still represents the personal and collective life and well-being of a community and concomitantly, the community’s customary territories. With reference to the Semai and Temiar Orang Asli ethnic subgroups, this interdisciplinary paper examines the potential relevance of Orang Asli forms of shamanism in the light of the relatively recent recognition of pre-existing Orang Asli land customs and usages by the Malaysian courts. These rights are established through, amongst other matters, the community’s maintenance of a traditional connection with the land claimed in accordance with customs distinctive to the particular community. It is suggested that the increased awareness of the Orang Asli on the legal significance of preserving and maintaining traditional knowledge relevant to demonstrate a traditional connection with their lands may, with guarded optimism, contribute to a resurgence of land and resource-related shamanistic practices in some Orang Asli communities. In stanza 24 of the Old Norse Eddic poem Lokasenna (written down some time around 1270 on the basis of earlier written and oral versions), the god Loki makes an accusation of disreputable practices against Óðinn, saying that “draptu á vétt sem vǫlor” (“you beat on a vétt like vǫlur,” i.e., female magical practitioners). The word vétt is puzzling, and its connections and derivation are unclear.1 The tantalizing and ambiguous information that can be deduced appears to point in several directions; I attempt here, if not to disentangle the intertwined roots of this problem, at least to allow it to yield some fruits in terms of how we position Old Norse magic in its cultural context. I begin by gathering the few instances of vétt and the possibly related vitt that I am aware of, along with some contextual animadversions, a good many of which consist of summaries of well-established previous research (which it seems worth relaying and commenting on for convenience), before moving on to look at a new possibility for the interpretation of the vétt. Review of: EGON WAMERS (Hrsg.) Bärenkult und Schamanenzauber. Rituale früher Jäger. Eine Ausstellung des Archäologischen Museums Frankfurt in Zusammenarbeit mit den Reiss-Engelhorn-Museen Mannheim und dem Neanderthal Museum Mettmann. Regensburg: Verlag Schnell & Steiner, 2015, 120 pp. ISBN 978-3-7954-3082-5.